Description: “Jesus, I trust in You”. 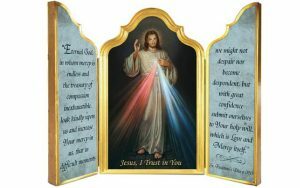 A beautiful presentation of Divine Mercy, this richly styled triptych reminds us of Our Lord’s mercy. This beautiful wood item measures 10” x 13” when opened with a smooth glossy finish, and hinged doors. Folds completely inward and flat. Ideal for any mantel or tabletop. 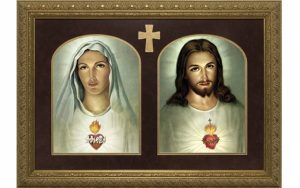 Description: Lovely matching images of the Sacred and Immaculate Hearts are some of the most beloved images of Mary and Jesus. 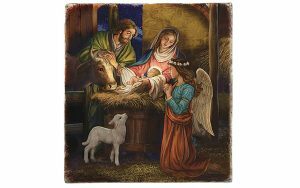 Image comes as a fine art print under premium clear glass, double-matted in burgundy over gold in a gold solid wood frame. 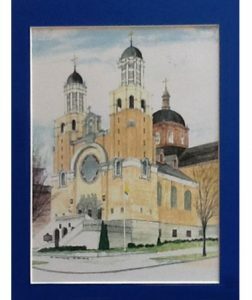 Description:Local Artist Allan Norris’ affinity for watercolor and his love of architecture led to depicting the Basilica of St. Mary of the Assumption with his brush. 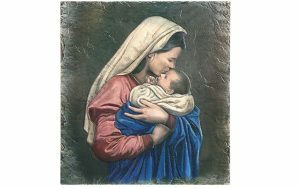 This beautiful print, made from the original watercolor, is double matted. 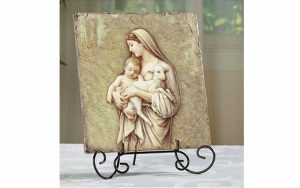 Description: Pairing favorite Catholic images with a textured tile surface creates a unique way to display this art as home décor. Each finely detailed tile can be hung on the wall or placed on the wire stand included as part of a free-standing vignette. 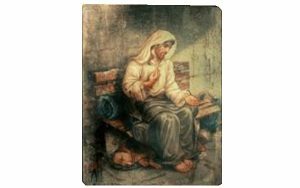 Description: Pairing the exquisite art of Michael Adams with a textured tile surface, Marco Sevelli creates a unique way to display this favorite Catholic image as home decor. 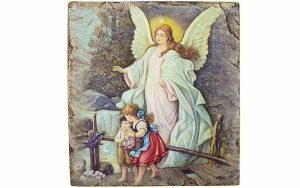 This finely detailed tile can be hung on the wall or placed on the wire stand included as part of a freestanding vignette. Description: Collection of 12 assorted 5” x 7” cards that include a mix of thank you, congratulations, birthday and care sentiment that makes it easy for you to send the perfect card for any occasion. 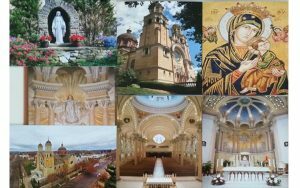 Each card features a sentiment written by Msgr. 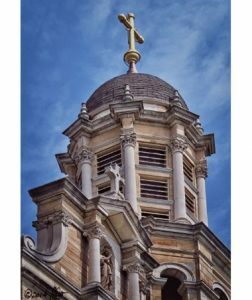 John Michael Campbell, Rector of the basilica, and one blank for your specific use. Cards come with a white envelope for mailing or gift giving. 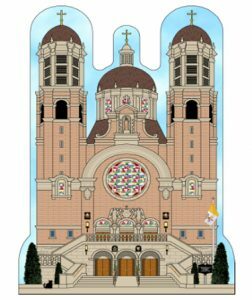 Description: Cats Meow is a two-dimensional wooden keepsake replica of the Basilica of Saint Mary of the Assumption. 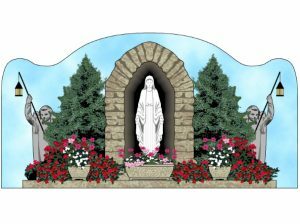 It provides a visual reminder of that special touch St. Mary’s has had on the lives of its members. 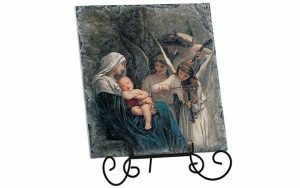 It is the perfect accent for almost any décor and can be easily displayed above windows and doorways, in windowsills, chair rails, desktops, or in any nook or cranny. On the reverse of this wooden keepsake is printed the text of the Official Proclamation from the Vatican declaring St. Mary to be a Basilica. Description: This work by acclaimed artist Michael Adams, titled “No Place to Rest,” evokes an emotional response in the viewer, bringing to the forefront thoughts about social justice and servanthood, and about each person’s covenant with the Creator to do justice, love mercy, and walk humbly with our God. 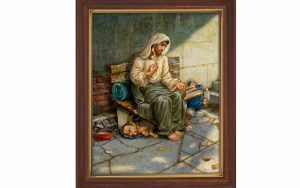 The piece is a reminder that Jesus, homeless himself, cared for every living creature regardless of their circumstances, and He asks us to do the same. 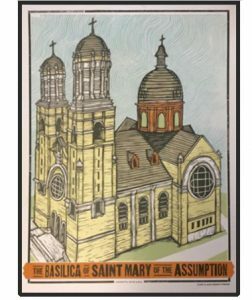 Description: This Basilica of Saint Mary of the Assumption poster image was designed by Just-A-Jar Press, a letterpress and design shop based out of Marietta, Ohio. All of their work is printed on a hand-cranked printing press. Their website explains: “Here at justAjar we are all about preserving and sharing the age-old crafts of typesetting and woodblock printing. All of our work is very labor intensive and of the highest quality.” The Basilica Poster is woodblock print and the type was set by hand.